The modern bail system traces its roots back to medieval England and is based on the idea that money or something of value will ensure a defendant's return to court and potentially restitution for his or her crime. As we've written previously, the system that demands money in exchange for freedom and as an incentive to return to court is largely flawed — benefitting those with the means to bail themselves out, incarcerating the people who don't. But in Washington state (and elsewhere) there is talk of change. Spokane County, as well as Yakima, is on the forefront of those reforms. Last week, a group of criminal justice players from Spokane County met in Seattle with their counterparts throughout the state. Members of the Pretrial Justice Institute and the Laura and John Arnold Foundation, national organizations pushing for change, were also on hand for a preliminary discussion about how to bring pretrial reform to Washington state. "One part of the discussion on Friday [was] that your statute requires judges to consider things at pretrial that have been shown not to be predictive of whether someone will reappear in court or get rearrested," says Cherise Fanno Burdeen, CEO of the Pretrial Justice Institute. For example, judges must consider, among other things, employment, connection to the community and availability of stable housing. Fanno Burdeen points to those factors and others that do not necessarily mean a person will skip court or get rearrested, and also potentially deepen the racial and ethnic disparity in pretrial decision-making. "Also, a lot of the discussion raised consistently last week was around concern for racial disparity," Fanno Burdeen says. "I was excited by the idea that your stakeholders across the state are mindful of those issues." Fanno Burdeen and the Pretrial Justice Institute are launching a nationwide campaign called "3 Days Count" to reform pretrial practices across the country. The goal is to implement reforms in 20 states by 2020. Washington state is not yet involved in the campaign, but is considering applying, Fanno Burdeen says. However, she is encouraged by efforts in Yakima and Spokane to change the way defendants are treated pretrial. • Spokane has hired three more employees for the Office of Pretrial Services, the office responsible for conducting initial interviews with those accused of crimes and monitoring those individuals if they're released from jail before trial. Cheryl Tofsrud, manager of the Pretrial Services Office, says she plans to hire three more. • By the end of this month, Spokane Regional Criminal Justice Administrator Jacquie van Wormer anticipates the roll-out of a brand new analytical tool to aid judges in pretrial decision-making. • Van Wormer also talks about a new "supervision matrix" that will assign defendants a score based on their charge and risk to skip court and reoffend. The score and corresponding matrix will help judges decide what level of community supervision is appropriate if the defendant is released. • Finally, Van Wormer says, Spokane County is working on creating a "bail-review docket." The specialized docket is still in the discussion phase, but the overall idea is to ensure people are not held in jail simply because they cannot afford to bail themselves out. The docket will act as a check on judge's initial decisions and allow them to consider new information that was not immediately available. Bail reform is a conversation that's been happening in Washington state and nationwide. The Washington State Supreme Court earlier this year organized a symposium on the topic of pretrial reform through its Minority and Justice Commission. And the U.S. Department of Justice recently weighed in on the case of Maurice Walker, a Georgia man held in jail for six days because he couldn't afford the $160 bail. 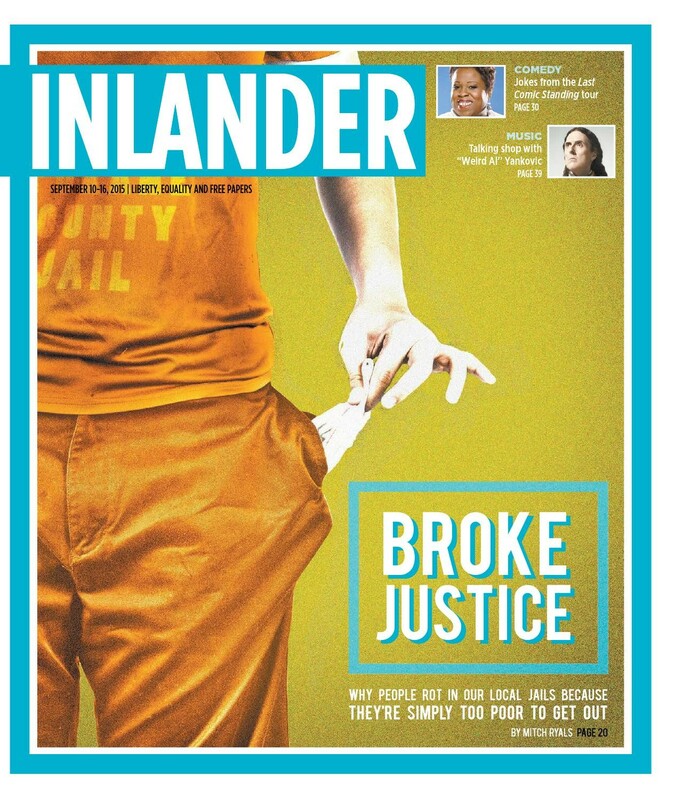 • Half of Spokane's jail population in 2014 was awaiting trial, and a one-day snapshot in June 2015 showed that 72 percent of inmates were being held on bail. • A report out this May from the Prison Policy Initiative revealed that 70 percent of the 646,000 inmates held in local jails nationwide were awaiting trial — innocent in the eyes of the law.